The following links are gathered to help you focus on the art of Customer Experience. Follow these bloggers to keep informed! The core component effecting business growth today is the experience your customers have with your people, processes, and services. Most importantly, you need to know what these experiences are and how your customers feel about them. This blog opens up the dialogue to help take you on the journey of improving YOUR customer's experiences! 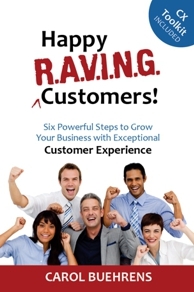 Carol Buehrens, Customer Experience Strategist and author of "Happy R.A.V.I.N.G. Customers!" What’s the Focus at Your Company?